The parish of Walsoken is situated in the west of Norfolk on the border with Cambridgeshire. It lies south of West Walton, north of Emneth and west of Marshland St James. The name Walsoken may derive from the Old English meaning ‘the district under particular jurisdiction by the wall’. 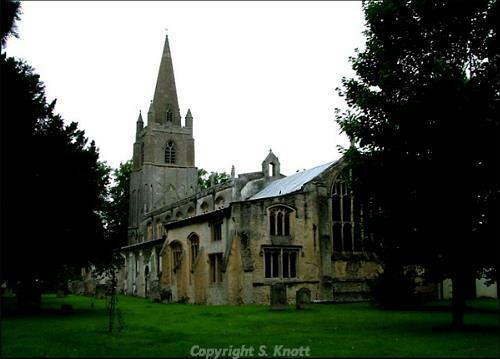 The parish has a long history and was established by the time of the Norman Conquest. Its population, land ownership and productive resources were detailed in the Domesday Book of 1086. This document revealed that the parish was held by the Benedictine Order based at Ramsey Abbey and possessed a fishery. Today Walsoken is a suburb of Wisbech and much of its historic core is lost under modern housing. The ground surface of pre-Roman times is completely submerged beneath the Iron Age silts. As such, very little early prehistoric archaeology has been recorded. It is possible that some dry land existed in Walsoken in the Bronze Age as a couple of artefacts were found in the 19th century. These objects comprise a copper alloy dagger/rapier (NHER 2387) and a socketed axehead from the site of the former brick works (NHER 2382). Additionally, part of a ships timber (a piece known as a thwart) has been recovered and tentatively dated to this era (NHER 13300). Rather more evidence has been found to attest to Roman occupation in the parish. Numerous pottery scatters have been recovered through fieldwalking (e.g. NHER 18927, 19028 and 19071). One particular area of pottery concentrations (NHER 18937) may indicate the presence of a small farmstead. Other areas of activity lie near to the Fengate Road (NHER 19169) and along the Wibech bypass (NHER 18931). Much of the pottery recovered from these locations was found atop roddons, a feature prolific in this fenland landscape. Another Roman site is situated on the eastern parish boundary (NHER 19071). Here, glass fragments, animal bones and shells accompanied the Roman pottery sherds and perhaps could be indicative of a domestic area. In addition to these pottery sherds a number of other Roman objects have been recovered. The most exciting of these are three coin hoards (NHER 18937, 2388 and 2205). A dispersed hoard of 300-400 Roman coins, mostly of Postumus, but including examples minted by Gallienus and Hostilian was found via metal detecting in the 1980s (NHER 18937). The other two hoards have been found in the Emneth area. The Emneth I hoard (NHER 2388) was discovered in 1938 and comprised a huge hoard of coins minted by Gordian III, Aurelian, Gallienus, Claudius II, Postumus, Victorianus and Tetricus I. Investigation of the coins suggested this hoard was buried in around AD 270-1. The Emneth III hoard (NHER 2205) included examples minted by Carausius, but it not clear whether this particular hoard was found in Walsoken parish or from across the border in Cambridgeshire. Other Roman artefacts include a weight from a steelyard (NHER 19629), a brooch (NHER 18924) and a pestle that would have been used in conjunction with a cosmetics mortar (NHER 19047). A few Saxon objects have been reported for Walsoken. The most impressive collection of objects has been found to the northwest of the parish (NHER 19047). At this site finds included Middle Saxon pins, pin beater and coins along with a Late Saxon strap end and pottery sherds. Fragments of several Early Saxon loomweights (NHER 18941) have also been discovered. The remaining objects take the form of pottery sherds (e.g. NHER 19056) found by the systematic fieldwalking survey undertaken in the parish. The majority of the records for Walsoken concern the medieval period. All Saints’ Church (NHER 2209) is the earliest still extant building in the parish. This superb church has a very fine late Norman nave and chancel with arcades. The tower dates to the mid 13th century but has been altered. The roofs, clerestory and east window are Perpendicular and were possibly added when the south chapel was rebuilt in 1536. The north aisle and chapel were altered at similar date. Inside, there is a font dating to 1544 and various fine benches and tombs. Additionally, the top of a medieval stone cross once stood in the south aisle (NHER 2208). Sadly, it went missing by the 1930s but the limestone rectangular base still stands outside the priest's door. The only other structure to remain is part of a Saxon/medieval sea bank (NHER 2187) visible on aerial photographs taken in 1946. As with previous eras occupation areas are indicated by pottery scatters, and a huge number have been reported. The medieval manor of Ramsey was located in the Popenhoe area (see NHER 2387) as attested to by dense scatters of pottery sherds (NHER 18936, 18938, 18939, 18940 and 18941). This area was presumably one settlement focus, with another centred on the church (NHER 2209). Several of the roddons (e.g. NHER 18920 and 18931) and possible trackways (e.g. NHER 18930 and 19169) in Walsoken may also date to the medieval period. Indeed, documents record that Walsoken had two medieval trackways to the Smeeth. Metal detecting has retrieved a decent selection of medieval artefacts. The most interesting of these comprise a dagger quillon (NHER 32615), seal matrix (NHER 19064) and a lead ampulla (NHER 19057). Other more mundane finds comprise a belt mount (NHER 29836), buckles (NHER 28269), cauldron fragments (NHER 28268 and 19629), coins (NHER 29026 and 28267) and a brooch (NHER 19047). The post medieval period is more sparsely represented in Walsoken. Austin House (NHER 47122), on the Burrett Gate Road, is the only listed building on record. This house dates to 1841 and has a gault brick facade and a slate roof. However, the interior has been renewed and is largely 20th century in date. Walsoken did have an operational brick and tile works during the post medieval period. This works was notable for its two 'Newcastle' kilns, the only examples to be recorded in Norfolk. The only other post medieval site to be found was identified by a fieldwalking survey. Remnants of building rubble from a post medieval building (NHER 19079) were recorded to the northwest of Leigh House, on Station Road. Metal detecting and fieldwalking have found several post medieval small finds. These comprise everyday objects like a key (NHER 18924), a stud (NHER 18923), a coin weight (NHER 19047) and a finger ring (NHER 18926). Of course numerous pottery sherds (e.g. NHER 18938 and 19047) and a couple of coins (NHER 32615) have also been discovered at various locations in Walsoken. The most recent record for the parish concerns a World War Two pillbox (NHER 19068). This hexagonal concrete structure stood to the east of Floral Farm on the First Marsh Road but was demolished in 1988.